But the fun doesn't end with performance improvements. It also adds some new features that will be critical to users across creative departments, including those working in video and motion graphics and those working in 3D or incorporate 3D into their 2D design projects. First up: the video features. Anybody upgrading to Adobe After Effects CS3 or Premiere Professional CS3 (now also available for Intel-based Macs, but not PowerPC-based Macs) is also going to need/want/crave Photoshop CS3 Extended. The reason for this is that the Extended version gains a number of enhancements that turn Photoshop into a rotoscoping, animation, and video enhancement demon. Unlike previous versions of Photoshop, it can open QuickTime and Windows Media files straight from the File menu, without any manual import or individual frames required. (This was a big drag in Photoshop CS2.) Now a user can just open a video file as if it were a still image file and begin working on it immediately. And, once you have the video opened, working with it is very similar to working with video in After Effects or Premiere Pro (or any other NLE or motion graphics package, for that matter). 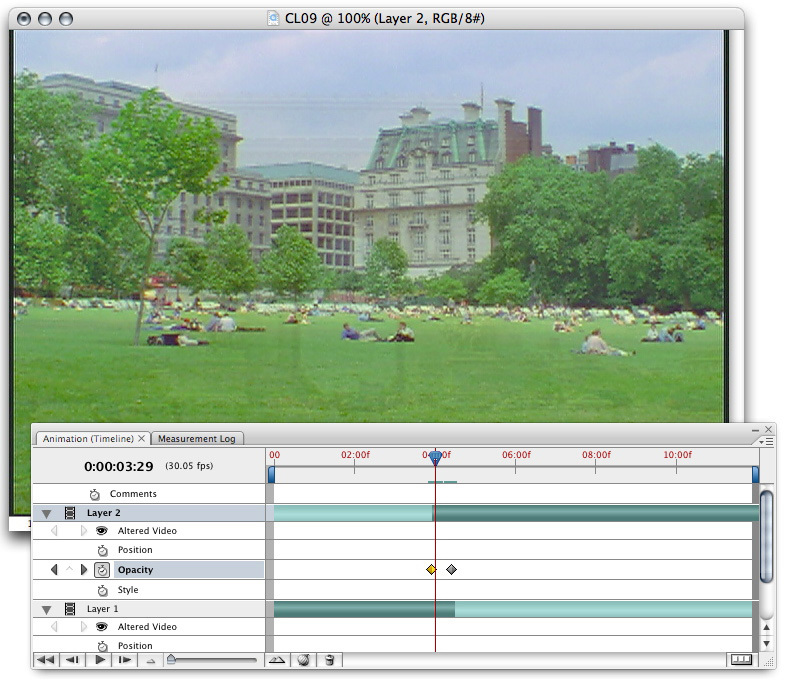 The newly revised Animation palette is similar in feel and functionality to the timeline in After Effects or Premiere. And it adds in several new functions as well. Support for keyframing of layer styles (such as Drop Shadow, Pattern Overlay, etc.). In addition to this, Photoshop CS3 Extended also supports rotoscoping with the program's built-in paint and cloning tools. So users can paint frame by frame or touch up frames one at a time. They can also use the Cone tool to clone pixels from one frame onto another to help clean up damaged footage or remove artifacts. Also for the first time in any incarnation of Photoshop, the Extended version allows users to export video as video by rendering it to any number of supported file types and codecs. These include: Windows Media, QuickTime, FLC, 3G, iPod video, AVI, DV stream, image sequence, MPEG-4, and--bum bum bum--Flash Video (FLV). 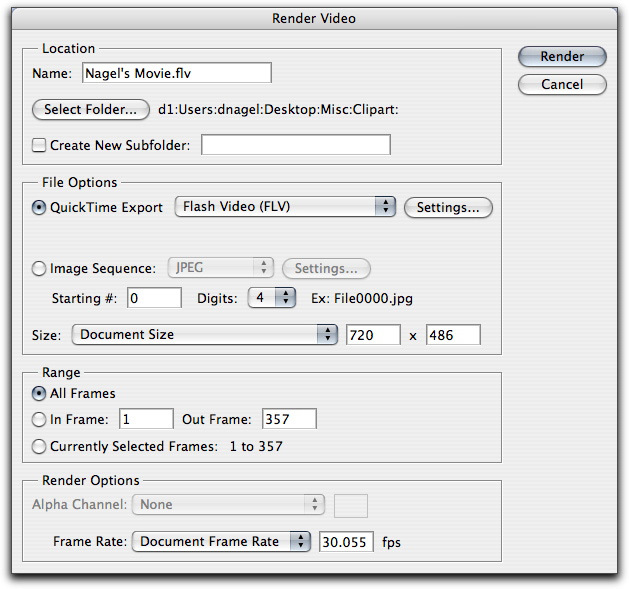 Video is exported through a new command at File > Export > Render Video. This command calls up a settings dialog that allows users to choose the format, set a frame range, apply cropping or fitting, and select a codec (for audio and video) along with the codec's settings (data rate, quality, bit depth, etc.). The Flash Video export support MP3 for audio and both Sorenson Spark and On2 VP6 for video. And finally, in addition to al that, the Photoshop file format now natively supports video layers. In other words, not only is video imported as a single layer and behaves just like any other layer, but video layers (plural) can also be stored in the document itself. This, of course, saves on render times, but it's particularly useful in that both After Effects and Premiere Pro will, in their upcoming releases, support this new file format natively. So Photoshop documents that contain video can be opened natively, and no further conversion is required. It's worth noting in the context of After Effects that Photoshop C3 Extended does support multiple bit-depths on video layers, including 8-, 16-, and 32-bit HDR, along with multiple color modes (RGB, CMYK, Lab, and grayscale). And it supports color management for video. Now, you've also no doubt herd about Photoshop CS3 Extended's 3D capabilities. But what does that mean? Is Photoshop trying to compete with Maya, 3DS Max and the rest of the 3D modeling and animation programs out there? No indeed. In fact, it's trying to work with them. Virtually every 3D artist uses Photoshop in one way or another--for creating textures, for working with materials, etc. Now in Photoshop, users can import 3D objects directly to the canvas and modify textures on the fly while also being able to see the results instantly on their models. Just as with video, Photoshop can open 3D files directly from the File menu, including OBJ, 3DS, KMZ (Google), Collada, and U3D. These file formats are al common export options for 3D modeling, animation, and CAD programs. And, just as with video files, these 3D layers can be manipulated in many ways like standard 2D layers, including blending options, layer styles, etc. (but no regular filters). In addition, Photoshop also provides a variety of tools for transforming the 3D objects and cameras that are imported, including rotation, roll, orbit, horizontal and vertical position, and zoom, among others. The screen shot below shows several of these features. 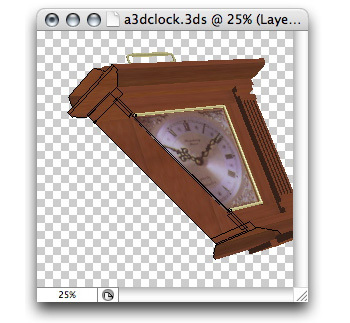 Photoshop can also create cross sections of the 3D model on multiple axes. Photoshop CS3 Extended is not, however, a modeler, and it doesn't offer advanced rendering options. Advanced rendering can be added by third-party developers through the new Photoshop API, according to Adobe. But that's about it. The new version does, however, offer the ability to extrude 2D images into 3D space through the expanded Vanishing Point feature. The previous version of Vanishing Point allowed for some 3D-like capabilities, but these were designed primarily for image retouching. Now the 3D planes created in Vanishing Point an be used as 3D data within Photoshop or exported to the DXF and 3DS file formats. On top of that, Vanishing Point extrusions can also be exported to a new After Effects-compatible format called .vpe, allowing motion graphics artists to bring in pre-designed 3D objects generated from 2D objects on After Effects-native 3D layers. Beyond the new creative features, PSCS3 Extended also adds several new tools for measurement and image analysis. On the measurement front, it includes the ability to create correlations between pixels in an image and distances represented. 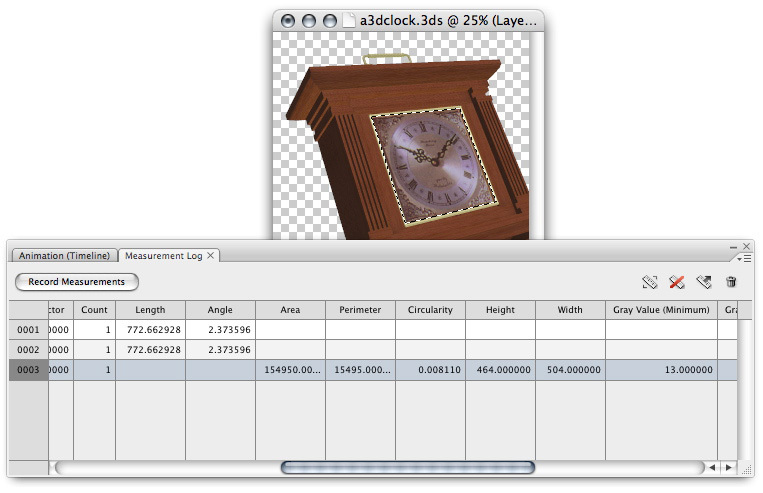 For example, a user can set a pixel to represent a yard, then conduct measurements with the new Measure tool to determine real-world dimensions of elements in an image. Users can also use selection tools and measure the area, perimeter, and other parameters of a selection. Measurements are then logged and can be exported to the .csv format. Enhanced "Merge to 32-bit HDR"
On top of all that, CS3 Extended also adds support for DICOM and MATLAB files for medical applications. These files can be imported as stacks as well, for applications like animating the layers of a brain scan. Photoshop CS3 Extended will be out soon as both a standalone application ($999) and as part of four different CS3 suites, including Design Premium, Web Premium, Production Premium, and the Master Collection. CS3 Master Collection site license: $12,499. The site licenses are available only to K-12 public and private qualifying schools at a single address and include: teacher home use rights and student computers that are owned or leased by the school. Dtails on whether or not the Production Premium edition will be offered in an education site licence package have not yet been released. In addition, Adobe will also offer education pricing for the boxed applications for individual users. More information about education pricing and site licenses will be available soon on Adobe's K-12 site, linked below. Upgrade pricing and site licenses are also available. See Adobe's site for more information on additional price configurations. Photoshop CS3 Extended supports Mac OS X 10.4.8 or higher running on Intel or PowerPC hardware, as well as Windows Vista and XP. We will continue to bring you more in depth articles covering the applications in Creative Suite 3 over the course of this week. Stay tuned!